"I Am Nicely! is Giving Away a Vintage Stylish Cellphone Mobile Design Watch Necklace on Her Birthday"
Nicely Rom, of I am Nicely, is holding a birthday blog contest and I am joining. Please read on to see the mechanics on how you can join, too. 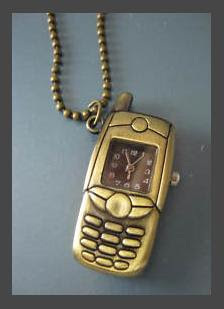 Up for grabs is a Vintage Stylish Cellphone Mobile Design Watch Necklace! Hi, guys! I would like to invite you to participate in another blog contest that I am holding in celebration of my birthday on December 7. It is so easy to join! 1. Copy and paste this entire post (including the necklace photo below) in your websites, blogs or facebook notes. 2. Kindly fill in the blank: All I wish for Nicely is _____. 3. The title of your post must exactly be "I Am Nicely! is Giving Away a Vintage Stylish Cellphone Mobile Design Watch Necklace on Her Birthday"
Deadline for submission of entries will be at 11:59PM of December 6, 2009. The winner will be drawn by an online raffle device and will be announced on my birthday. The lucky one will then receive a Vintage Stylish Cellphone Mobile Design Watch Necklace, courtesy of my eBay.ph sponsor, Tinatindera. The winner will be informed of his/her winning through e-mail and the item will be sent to his/her preferred mailing address not later than December 14, 2009. The prize is not refundable for cash. Good luck and thank you for your continued support to I Am Nicely! ♥lots! All I wish for Nicely is health and happiness in all the days to come.